Take a look around you in nature and you will be surprised by the fact that no creature is an island, there are thousands of creatures living happily in symbiotic relationships. In fact, they are so common that even us humans live in a symbiotic relationship albeit with bacteria. We have nearly 400 different types of bacteria in our stomach and guts that aide in our digestion, and they are so important that without them we would probably not survive. They process many things for us, from producing vitamin K to digesting milk. People who are lactose intolerant generally are lacking the right mix of bacteria in their stomach to digest lactose properly. Looking at the animal world, especially the underwater one, there are thousands of almost every conceivable symbiotic relationship. So what exactly is Symbiosis? It is defined as any permanent or long-lasting association between two or more different species of organisms. Each relationship has two participants, generally a larger one named the host, and a smaller one referred to as the symbiont. As a general rule, the host’s role in the relationship is to provide a place to live and nourishment for the symbiont. On the other hand, the symbiont can offer an immense variety of attributes from specialized biological processes to basic cleaning functions. There is definitely a much larger variety in what the symbiont provides its host. Overall, symbiotic relationships are categorized by the type off association, level of intimacy, and the overall level of dependence. Like any good relationship there are many ways to make it successful, and as such there are three main types of symbiotic relationships. Mutualism: this is a relationship whereby both partners actually gain a benefit from the relationship. Think of every time you have seen a goby standing guard over its pistol shrimp partner. In this relationship, the goby gains the benefit of having a burrow to live in and seek shelter from predators. On the other hand, the shrimp, which is blind, has the benefit of the goby’s eyesight to stand guard and protect it from predators. It’s a win-win for everyone, although the poor shrimp has to continuously keep digging and cleaning its burrow, which seems like a lot of hard work. Other mutualistic relationships underwater include that of corals (host) and zooxanthellae (symbiont), cleaner fish/shrimps and of anemonefish with their host anemones. Anemones benefit from having a very territorial protector that cleans the tentacles from food scraps and the anemonefish gains shelter and food scraps from the association. Commensalism: contrarily to mutualism, in this type of relationship, one of the party’s gains significantly from the relationship, usually in terms of food, transport or shelter, while the other party is unaffected. Note that it is fine line between mutualism, commensalism and parasitic relationships since the slightest negative impact on the host will turn the relationship into a parasitic one. 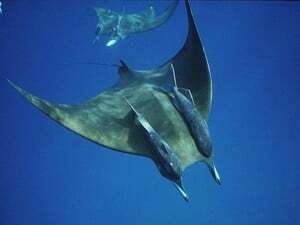 The most common of these relationships is that between remoras and their various hosts. Remoras attach their suckers to bigger pelagic creatures like sharks, dugongs and sea turtles and benefit from the protection, transport and food scraps of their ride. 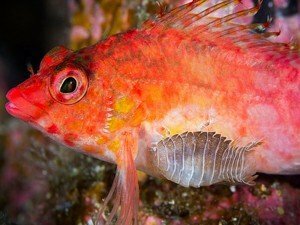 Other commensal relationships include emperor shrimps finding shelter and transport on various nudibranchs and sea cucumbers and the small crabs and shrimps gaining protection and transport on their host fire urchin. Parasitism: a symbiotic relationship where one species gains (symbiont) by depending of its host in a negative way. Parasitic relationships are harmful for the host, who can even die from it. One example of a non-fatal parasitic relationship is the parasitic isopod crustacean that attaches itself on fish flesh to gorge from it. Basically, there are two methods of symbiosis that are used. Either via ectosymbiosis or endosymbiosis. Ectosymbiosis: is where the symbiont lives either outside or attached to the host’s cells. This can include bacterial symbionts like those found in humans that live in our intestinal tract. 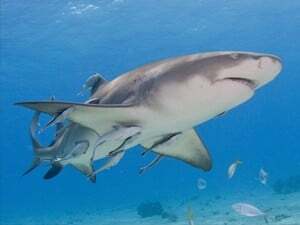 In the underwater world it includes remoras and manta/sharks, whereby the remora lives attached to the manta ray or shark. Learn more about Manta rays symbiosis and cleaning stations and social behavior. Endosymbiosis: is generally much more complex and is when the symbiont lives within the host’s cells, it is often referred to as intracellular symbiosis. One of the biggest participants in intracellular symbiosis is the zooxanthellae algae living inside the coral polyps’ tissues. The final classification of symbiosis is how closely linked are the two organisms. Generally, through evolution many creatures have evolved to live so closely together that their symbiosis is called Obligate symbiosis. This is where it has now become impossible for one of the organisms to actually survive without the other for any length of time. The classic example of this are the tube worms that live near hydrothermal vents on the ocean floor. They completely lack a digestive system and rely completely on their symbiotic bacteria to break down hydrogen sulphide or methane to supply them with nutrients. 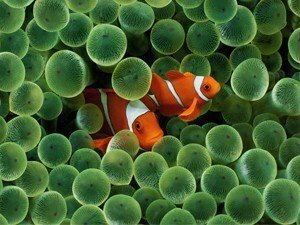 Another example are the anemonefish and anemones: anemonefish are never found surviving without an anemone host anymore. Non-Obligate or Facultative symbiosis, on the other hand, is one whereby both creatures can actually survive independently of each other, however their relationship increases the productivity of one or both of their lives. Example of this are the emperor shrimps and the many nudibranchs they live on. Next time you are in the water, have a good look around and pay close attention – you will be surprised by how many symbiotic relationships you will find on any average reef dive. 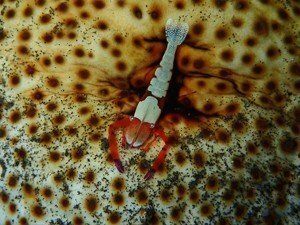 So what is the most prevalent Symbiotic relationship out there? The most important symbiotic relationship out there in the marine environment is that of coral reefs. 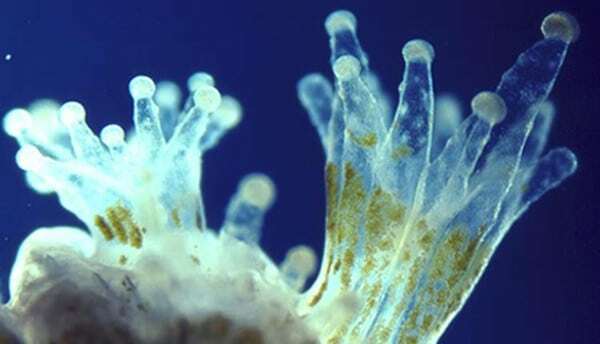 Coral polyps live in a symbiotic relationship with zooxanthellae algae which provide them with nutrients to thrive through the process of photosynthesis. How can you tell what is a symbiotic vs. parasitic relationship? The rule is that the relationship should not be harmful to any participants. This can sometimes be quite difficult to establish. Take the example of hermit crabs and the anemones they place on their shells. While it is quite clear what the crab benefits by having an anemone laden shell on its back (protection) , it can be hard to determine what the anemone benefits from. As it turns out, the anemone benefits from a higher probability of catching food because it is constantly moving on the crab’s back. Can symbiosis ever cross the line and be harmful? Well the saying goes that too much of a good thing can be bad, and this has never been truer than when it comes to symbiosis. Sometimes inadvertently one of the parties can damage the other. Take for example fish lice. These creatures normally have a happy symbiotic relationship with small fish and provide some cleaning services. However, when they become two numerous they can actually kill the host fish. Other symbionts are even known to grow so large that they end up retarding the growth of their partners. Would the relationships between pilot fish and sharks, dugongs etc. be classed as symbiotic? Definitely yes, although it is not a mutualist relationship since the bigger host does not actually gain anything from having the small pilot fish swim around them. This is a classic example of commensalism since the small fish are protected from predators by being next to such a large creature, added to that most often these small fish tend to feed on the tiny scraps and morsels generated by such a large animal’s feeding behaviour.